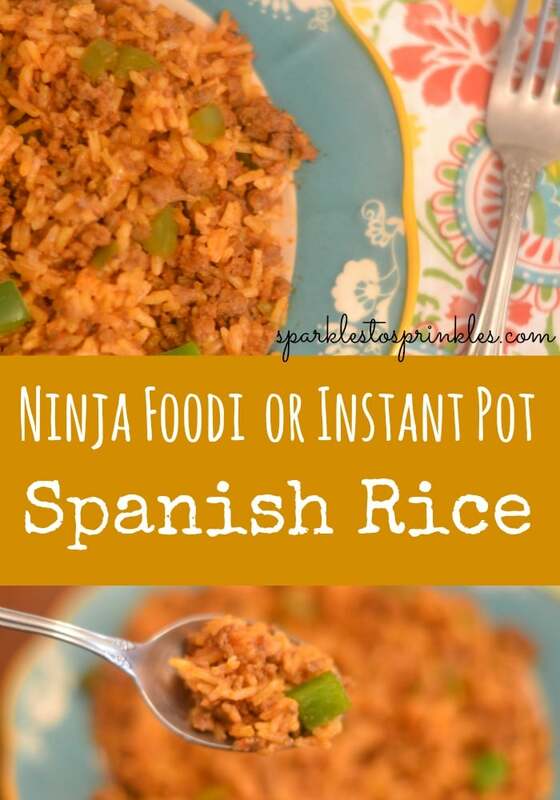 My Ninja Foodi or Instant Pot Spanish Rice is one festive maid dish or even side recipe to make. You have tender rice, peppers, spices, ground beef and more that come together to make this a showstopping dish. Add some cornbread to call it a meal, or serve as a side to your main dish. 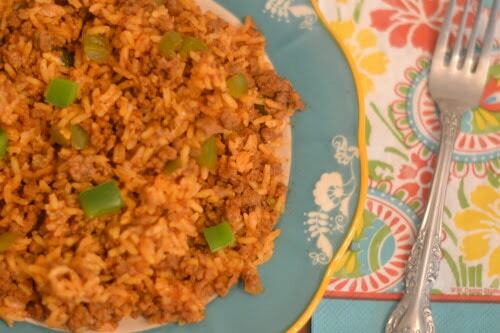 Now, some call this Mexican rice while others prefer the term Spanish rice. However you like to call it, we all can agree it is tasty as can be. Nothing beats a good rice dish in my books! Plus with the Ninja Foodi it really locks in the flavors and reaches a high pressure so the flavors truly infuse together as it cooks. This also pairs perfectly with a fajita dinner. My Instant Pot Chicken Fajita’s are always a hit as well as my Instant Pot Sous Vide Steak Fajita’s. Having a more casual meal, pair the rice with these delicious Ham and Cheese Ninja Foodi Stromboli. When cooking in the Ninja Foodi or even my Instant Pot I prefer to use long grain rice. I find that it withstands the pressure and when you hit that release of pressure and lift the lid, you get light and fluffy rice. This is a recipe that wouldn’t work with say minute rice. It could break down too much as it is cooking and leave you a more mushy mess. Another thing I want to touch on is the spice factor. You can always amplify the flavor by adding in more spices once it is done cooking to add an element of spice if you want. I start at a normal amount and then allow each member to adjust to their liking. You can’t take away the heat if you add too much to start with. And people could always even add in a dash of hot sauce to mix in for added heat. For my recipe, I love to use ground beef, fresh onion, peppers, garlic, and then tomato juice, and some seasonings, and rice. Then toss in the Ninja Foodi and let it work its magic by pressurizing and really giving it that low and slow-simmered taste in a fraction of the time. I hope you all enjoy my Spanish Rice recipe. I have really loved using my Ninja for making rice dishes. Because it offers the electric pressure cooker feature it really helps marry the flavors quickly and I end up with fluffy rice each and every time. Sometimes I would always run low on liquid as it cooked down on the stove but with my Foodi, it locks in the liquid as it cooks to really deepen and enhance the flavors. 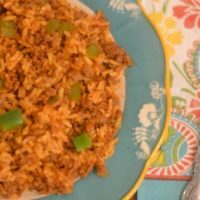 Absolutely delicious Ninja Foodi Or Instant Pot Spanish Rice is so reminiscent of my moms old Spanish rice recipe. 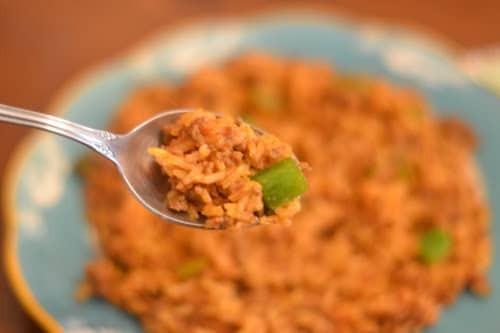 Loaded with chopped meat making this a hearty rice. Press Sear/Saute, High and then press Start. Brown the ground beef, drain excess oil. Add in the onion, green pepper, garlic and chili powder. Cook until the vegetables are tender. Add in remaining ingredients, give it a stir to combine. Place your pressure lid on and secure. Press, Pressure cook, change temp to Low. Set time to 12 minutes.